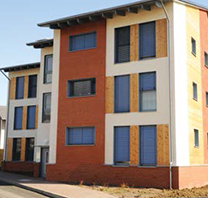 Read about a new Coventry University case study, ‘New energy efficiency interface for Orbit Housing Association’. Knowledge Transfer Partnership has empowered Orbit housing association staff to monitor retrofitting for future savings. Previous research projects with Orbit have seen the Cogent Computing Research Centre at Coventry University install new wireless sensors to monitor the energy efficiency of “green” technologies in the home. Orbit required a long-term solution to empower its own staff to take control of the sensing technology for use in future retrofitting projects. Dr. Daniel Goldsmith undertook this project whilst studying for his PhD in Wireless Sensing. Funded by the Knowledge Transfer Partnership scheme, Dr. Goldsmith developed and installed a new online user interface that will evaluate the energy efficiency of ongoing retrofit projects in Orbit’s housing developments. Data collected by the sensors is stored in a central online hub and then presented through a dashboard of useful diagrams. Dr. Goldsmith worked closely with Orbit staff to ensure the interface would be easy to use and meet their practical requirements. He also worked with Coventry University’s department of Civil Engineering, Architecture and Building to ensure the technologies used were suitable to the homes they were installed in. To ensure the longevity of Orbit’s retrofitting programme, Dr Goldsmith also trained Orbit surveyors to install the sensing technology and analyse the data collected via the online interface. The new online interface means that Orbit’s surveyors no longer need to retrieve data manually by visiting residents, thus saving both time and money. The Orbit team now has a much better idea of the energy saving technologies it should be using and how to maximize these to save money for the company and its residents. Furthermore, Orbit has used the expertise of Dr Goldsmith and the Cogent team to develop their strategic direction for retrofit technologies, identifying savings of circa £40m over a 15 year period. Cogent continues to work with Orbit on other energy efficiency projects and is now developing its sensing system for use by the Energy Technology Institute and other housing associations.